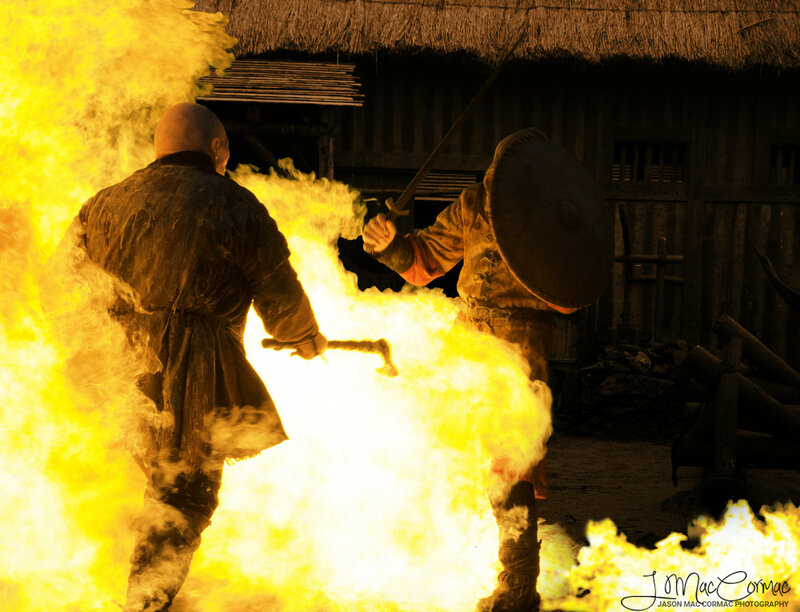 Recently I had a very interesting day of photographing historical warriors, with full on battle cries, shields swords and axes swinging and a fiery ending as a fireball erupted on two of the warriors and they fought on regardless of the fact they were engulfed with flames. 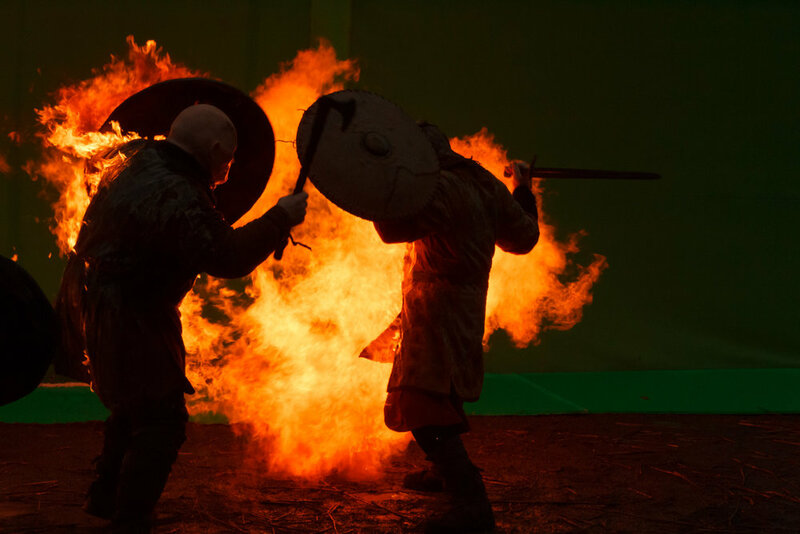 I was helping to shoot still images for stunt crew Stunt Register Ireland as they filmed live action scenes and a dramatic battle scene involving fire. #Vikings stunt crew Stunt Register Ireland. When I arrived at the film studios on the outdoor set the crew were on the side of a mountain with a large rig of green screen, the weather quickly was taking a turn for the worst and not in keeping with the forecast. It was decided to regroup in the lower valley of the film studios were the Viking village scenes are filmed. It was like army manoeuvres all the costume team, the actors, the riggers, and the stunt crew along with the camera and sound crew packed up and with lots of 4x4s made their way to the new location. The green screen itself was about 40 foot high x 80 foot wide and had to be disassembled and reassembled within the hour, no mean feat. The new location was big improvement and but for the rain you would think it was a lovely calm day. Down at the new location the green screen was being assembled and the camera crew got set up, the stunt team gathered, discussed tactics, practised fight scenes, and got dirty and bloody courtesy of the makeup and costume team. The costumes and the shields and weapons were very realistic!! These guys don’t mess around, during the practice fight scenes it was easy to tell they had trained hard and knew how to move with weapons, as one wrong move could hurt! Having trained to black belt level myself when I was younger I admired their skills. One against two full on battle. Time for some serious chats on the plan for the day who would team up for the fights saxon vs viking, but also time for a few laughs and camaraderie. After a lot of preparation the camera crew were ready, lights camera rolling action shouts went around from the lead team and everyone watched on as back and forth across screen the stunt crew acted out a full on battle with roars and battle cries, it was quite impressive to watch. Whilst many of the stunt crew were engaging in battle in front of camera, two of the members of Stunt Register Ireland were being readied for what could be the most dangerous stunt they had filmed. In a hidden tent to right of set, fire retardent clothing, breathing apparatus, syntethic face masks and their viking costumes were being donned, then as if it wasn’t mad enough acelerants were being added to their clothes to help the flames catch and literally accelerate as the cameras rolled. The fire team prepped a gas canister and an explosive concoction to create a huge fireball, the plan was this would engulf the two fighters and they would continue fighting as the flames roared until they could fight no more. After a great day of shooting I got back home and loaded the photos onto the computer. Despite the rain and at times fast paced action I think they turned out very well. Some images have motion blur in the fight scenes as the weapons swung which is in keeping with the action I think. Others its clear to see how heavy the rain was falling as it speckled entire scenes. And yet throughout the guys were utterly professional and cheerfully got on about the business of creating an action packed drama series. Its no wonder Vikings has proved so popular and been shooting for so many seasons. I would have loved to have been able to set up in the studios to capture some classic portraits, alas the weather and time was against us. These guys had to wrap up shooting the stunt scenes and the indoor studios were busy with actors and crew milling about creating stunning new episodes for the next season. My day’s work with the stunt crew was sadly over. Thanks guys for the invite !! Thanks for reading, please leave a comment or message me directly, bye for now. A few of my edited images below from the green screen were I added suitable backgrounds.